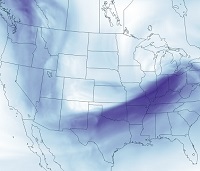 Dynamical Convergence A team of scientists led by PNNL has developed a mathematical framework that provides guidance to how global climate models can more accurately simulate the behavior of the all-important jet stream, seen here in darker blue. Photo courtesy of the National Oceanic and Atmospheric Administration . Enlarge Image. Results: The complex models scientists rely on to determine weather and potential climate changes have a hidden flaw. They cannot agree on the behavior of one of the most important circulation features: the jet stream. The strength and position of the jet stream are good indicators of weather events. Now, as reported in the Journal of Climate, a team of researchers led by Pacific Northwest National Laboratory has developed a diagnostic framework that can predict how well a model will simulate the jet stream. This framework may prove a milestone in accurately capturing jet stream dynamics and location. 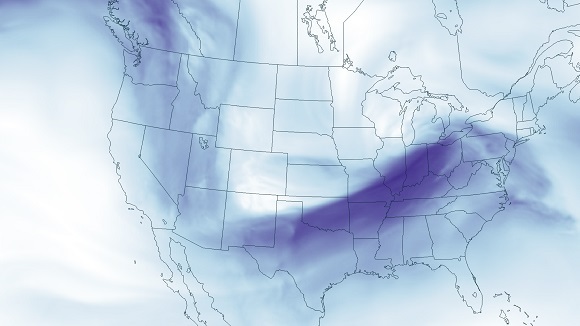 "Less spatially detailed models often struggle to simulate the jet stream's complex behavior," said Dr. Jian Lu, PNNL Earth systems scientist, lead author of the paper. "As the models become more spatially detailed, the calculations converge into a simpler form. For the first time, we began to explain why this convergence comes closer to fully capturing jet stream location and dynamics." Why It Matters: As the grandest feature of atmospheric circulation over much of North America, the jet stream plays a key role in orchestrating weather systems that usher in the seasons. Its general behavior has been simulated with reasonable realism since the days of the earliest climate models. Yet, decades later, the most state-of-the-art global climate models such as those participating in the Coupled Model Inter-Comparison project (CMIP) still cannot accurately locate the westerly jet. These struggles have undermined the effectiveness of the climate models in simulating the present climate and in projecting future trends, especially when regional details are important. The results of this study can serve as an important basis to identify models most likely to accurately locate the jet stream and simulate its dynamics. The framework can also serve as a tool for research centers across the world in choosing the appropriate model resolution for future generations of the CMIP, which will bring together a diverse scientific community to systematically understand, validate, compare, and improve climate models. Methods: To understand the dynamics of the jet stream, the PNNL team started with a simple configuration of the Earth as an aquaplanet covered only by ocean, using model versions that are spatially less-detailed and more-detailed. The study used three climate models that handle the basic atmospheric calculations and physics in different ways. The researchers then employed a number of scientific theories and a set of sophisticated calculations to arrive at a mathematical framework to diagnose how climate model resolution affected the simulation of the location and dynamics of the jet stream. What's Next? The natural next step is to apply a similar diagnostic framework to extreme atmospheric phenomena similar to the jet stream, such as atmospheric rivers. These narrow bands of concentrated moisture are often responsible for flooding on the West Coast of North America. Scientists want to understand how changing the dynamics of the jet stream in models can change how the model predicts the timing and location of these extreme phenomena. Sponsor: The U.S. Department of Energy's (DOE's) Office of Science supported this work as part of the Regional and Global Climate Modeling Program.